Crohn’s falls into the category of auto-immune diseases, which means that the body is attacking itself for some unknown reason. Just as arthritis attacks the joints, Crohn’s attacks the whole digestive tract causing depilating inflammation. They don’t know why this is but most treatments require suppressing the entire immune system to control the area of inflammation in the gut. When the whole immune system is suppressed, our natural healing abilities are also suppressed. Nothing in the body is being given a chance to heal. For most of my life I was suppressing and it wasn’t until I started SUPPORTING my immune system, I got well. I share this information with you all because I want others who suffer from Crohn’s/IBD (or any disease) to know that there are options. Dr’s told me all my life that I will always have to take toxic med’s in order to keep remission. I never once achieved remission while on the long list of drugs I tried. I hear this not only from close people I know but being part of the health community online, I read about it daily on blogs, forums and different pages. 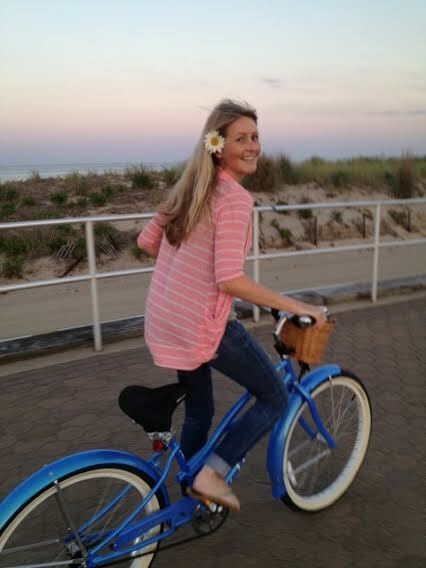 How patients are turning away from the advise of their Dr’s and heading on their own path to wellness. How people like me, don’t believe in suppressing the entire body. I research nearly everyday on this topic and it makes sense to me more and more on how medication isn’t the answer. It is nearly a band-aid on a wound that will never heal. The body has the ability to create disease, it therefore has the ability to heal itself. Disease, illness and cancer are the body’s cry out for attention. It needs you to stop what you are doing and provide it with an abundance of love and respect. If you can detox, feed your body only healthy things and feed your mind with positivity and love, there is a huge chance that your body will love you back. 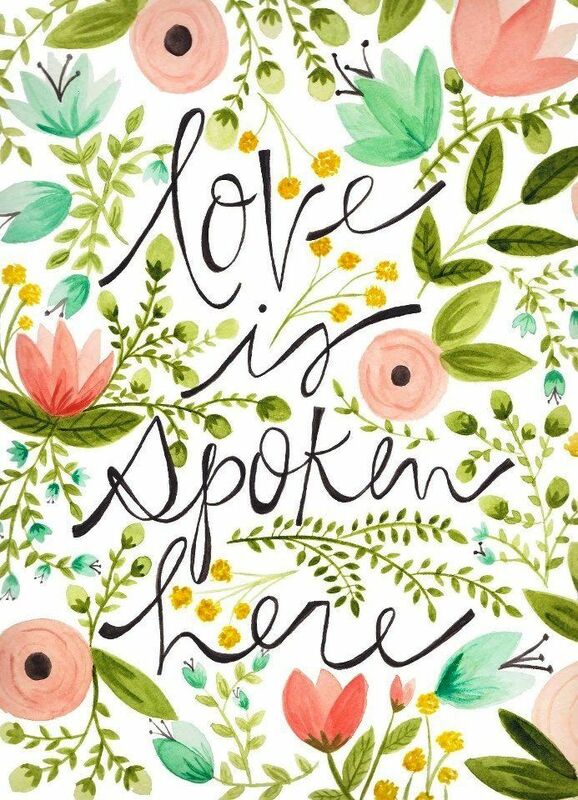 I know it did for me and I hope it does for all who I inspire. To many struggling with a digestive disease, eating simple things like lettuce or uncooked vegetables or even an apple can present a lot of issues. My first rule of advise is to start slow. Before starting raw or adding more “rouphage” into your diet, you must have somewhat healed intestines. If you are flaring, have inflamation or are not at a healthy standpoint with your Crohn’s, you can’t just throw roughage at your insides. Picture a raw burning rash on your arm. Would you go rub sandpaper on it? I’m sure you would much rather rub soft, warm or cooling, healing things on it, right? Treat your insides as anything else you would treat on the outside. You need to control the rash inside & soothing it before any fiber and roughage is introduced. I can’t write up a specific plan for all of you but I can form a guide and some good tips on how to get started. Remember- we are all different! Our bodies can handle different limits and it is most important to learn to listen to your body’s capabilities. ~Eat light, but often (no big meals), consuming soft & healing foods. Remember you want to sooth the intestines, not overfill or rough them up. ~Aloe water is a great intestinal healer. My favorite brand is George’s. It can be drank straight or added to smoothies. ~Turmeric, garlic and boswelia are great healers because they help to lower inflammation. When inflammation decreases, the intestines are given a better chance to thrive and heal. ~Starting a good probiotic if you already haven’t. 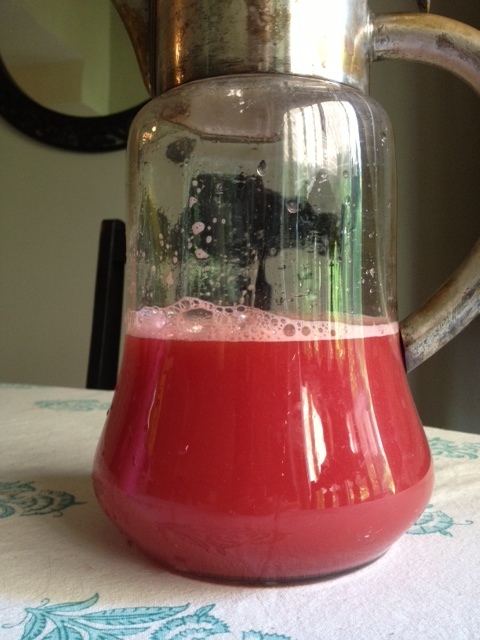 This will help flush out the bad bacteria that may be thriving in your unhealthy gut environment. ~Drinking broth throughout the day. I like making my own organic chicken stock. If you are not into the idea of bone broths, then go for an all-veggie broth with kombu for added minerals and iron. Broths can bring you lots of beneficial nutrients, while keeping you hydrated and also being easy on the digestive tract. ~Glutamine pills to help re-build and strengthen the walls of the intestines. These can back you up so take one pill to start and see how you do from there. ~Chia seed pudding is a great thing to add to your healing repertoire. It is filled with good fats and the gel-like coating that is formed once the seeds are added to liquid lubricate the intestines and act as a sweeper to pull out any toxins and to keep the waste moving through while also hydrating the colon. Since these seeds are not broken down (they come out whole) go slow at first – a tablespoon a day and increase from there if you are able to digest. Cultured and fermented foods, which are rich with naturally occurring probiotics, enzymes, B vitamins, can be one of the better methods for improving intestinal function and reducing inflammation. Traditionally fermented foods include sauerkraut, kimche, kvass, sourdough, kefir, yogurt, natto, miso, cultured fruits and vegetables. Fermented foods also have the ability to chelate toxic, heavy metals from the GI tract, such as mercury and lead. I love raw sauerkraut and pickles – my fridge is filled with jars of different brands! Just a tablespoon of raw kraut or one raw fermented pickle with each meal is beneficial for your gut and will help to heal your gut lining and whole gut environment through balance of the flora. Chew, Chew and Chew some more! You want your food to be a paste before you swallow. No bits and pieces going down the pipe! This is how things get clogged! Remember that digestion starts in the mouth. Begin the process diligently and help your body out by starting the few steps it takes to break food down. Good rule of thumb: Chew your liquids and drink your food! Find a fruit and vegetable that your body can handle and incorporate that into your daily meals. Pick a food that does not require a lot of digestion…think soft and delicate things such as banana’s, avocados, baked sweet potatoes, apple sauce, watermelon, pineapple, bib lettuce, peeled cucumbers to name a few. Start there and gradually add more when you can. Puree’ steamed veggies, mash up fruits, make soups, pulse up pesto’s made from greens and blend up green smoothies and raw green soups. The idea here is the break down the foods so that your body will be doing less work and hopefully extracting more nutrients in the process. 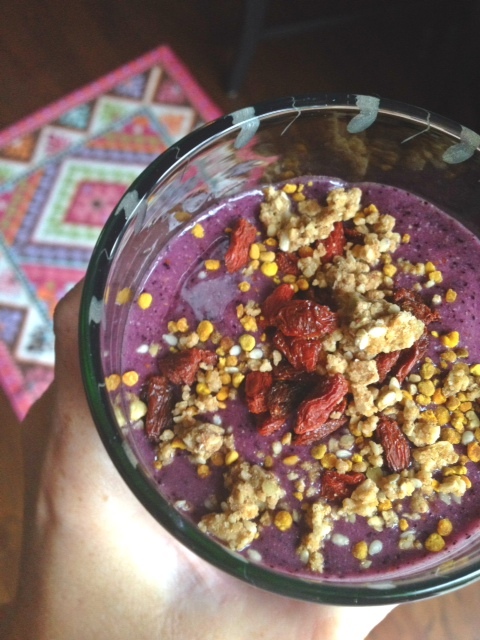 Get creative here and think soft and healing foods! When introducing fiber, you do not want to jump the gun. Add things slowly by eating small servings. If you try to eat a huge amount of something you’re body isn’t used to, your intestines will be building up bloat, firing out gas, and having a hard time knowing what to do with all the roughage coming its way. Remember, this isn’t about adding as many healthy things in as you can. Adding in healthy foods at a faster rate, doesn’t necessarily mean its going to heal you any faster. Remember that you are re-teaching your body how to heal and function properly. Don’t throw too much at it. Make it a goal to add one raw or vegan meal a day. If you accomplish that, live with it for a while and add more when you are comfortable. Baby servings and baby steps to health. These are a great way to give your intestines a rest. I absolutely love doing jucies and smoothies till dinner. You not only get all of your nutrients this way, but you also give your insides a chance to heal and spend some time relaxing instead of over-working or taxing themselves to heal AND digest at the same time. If you incorporate just one green smoothie a day, you are doing great things for your body!! I myself, even though my intestines are in a good state, can’t do ALL raw. Unless I am pureeing everything, they just can’t handle roughage with each meal. One to two meals per day with vegetables in their raw state is enough for me. The rest are either cooked or flash steamed. Don’t over strive for being a radical & strict vegan or raw foodist. Be flexible and work with your own needs! Surround yourself with only a solid support team. Breath air deep into your belly. Stretch it all out with yoga. Lose all tension in your mid-section. Don’t worry. It gets you no where. Surrender to your spiritual side. 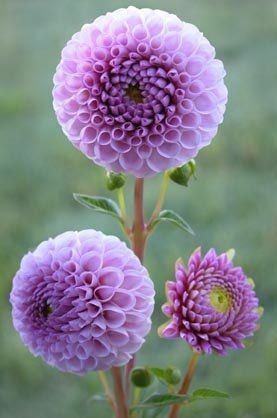 Surround yourself in beauty and find the beauty in every little thing. 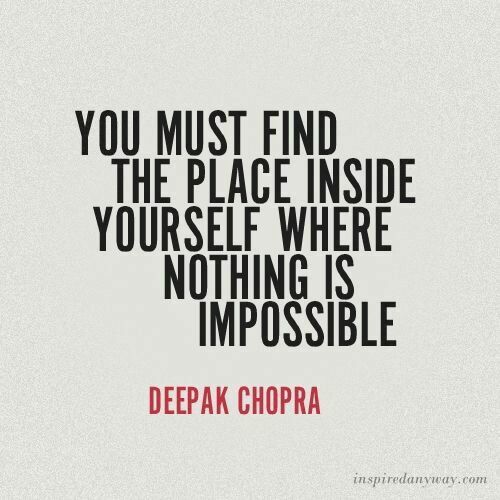 Pull strength from deep within. Create flow in your life. Unblock any stagnation. Support your lymphatic system (invest in a rebounder). I am absolutely loving veggies so much lately. It’s all I’ve been craving! 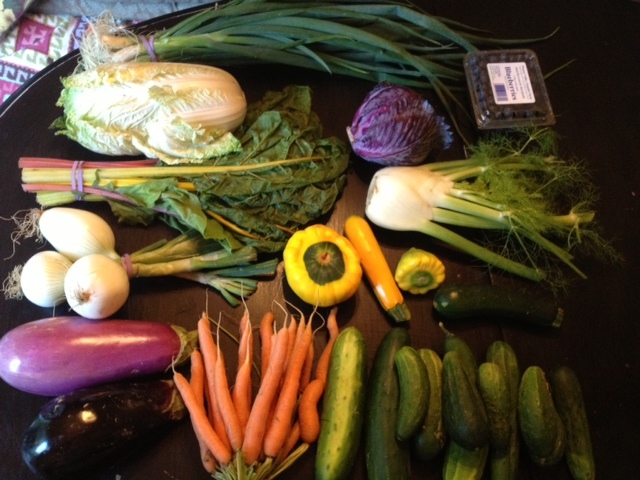 This is my farm share that I received last week. It didn’t last too long with my appetite! 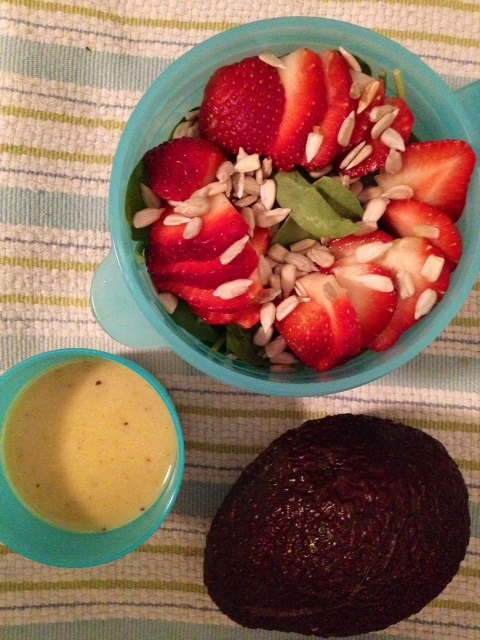 I am loving rainbow salads – full of color, vibrancy and nutrition! Making salads look pretty and choosing bright ingredients make them more fun to eat. I like having separate orderly piles of my goodies…I know its odd, but for whatever reason, it tastes better to me this way. Add a 1/4 tsp of coconut oil to saute pan. 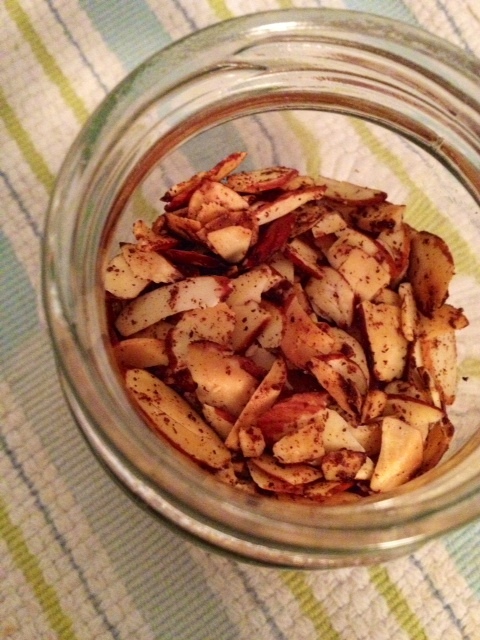 Slowly toast almond slivers, tossing often to prevent burning. Just as they start to toast (you will start to smell their toasted fragrance) sprinkle with cinnamon and sugar and remove from heat. Assemble the salad ingredients up to the strawberries. Mix the dressing ingredients in a small bowl. Pour the dressing over top then sprinkle with the almonds and sunflower seeds. This makes two smaller salads or one large salad. 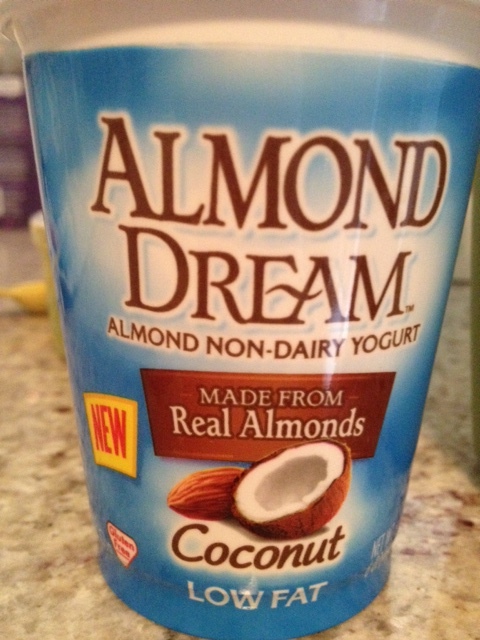 My advise: make a giant batch of these almonds – they are addicting and really great to have on salads! 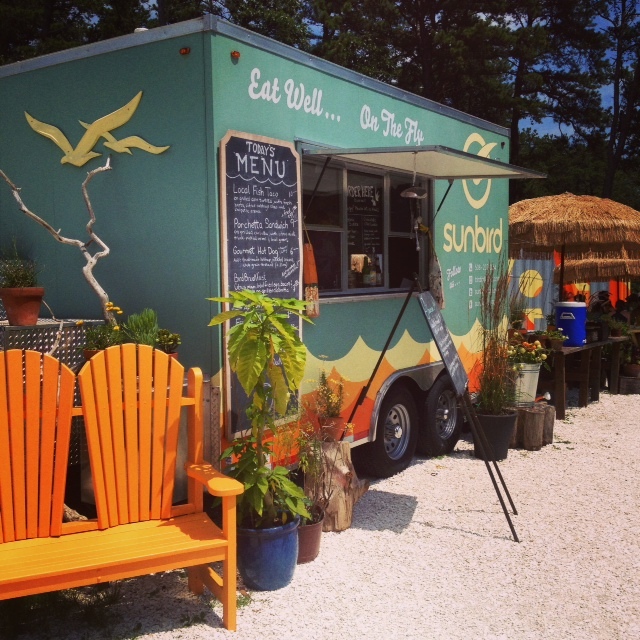 I am totally in love with this food truck I discovered near my Grandparents in Cape Cod. I visit them often and there are typically no vegan options anywhere near so I was ecstatic to find this cool place. Everything is made with love from local & fresh ingredients, mostly organic. I ordered this spicy asian greens salad with a citrus dressing. 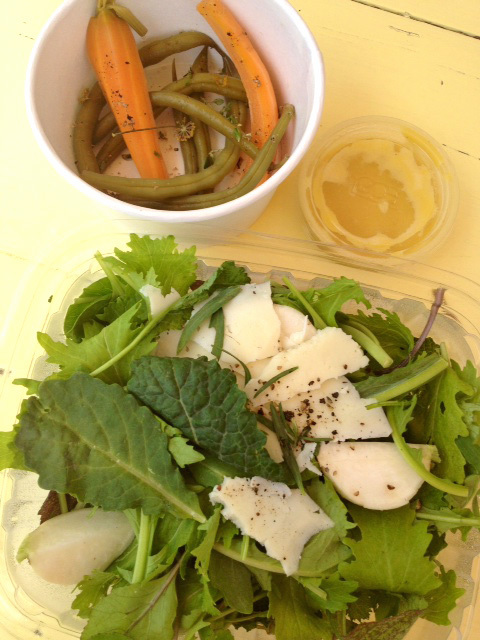 WOW – I was blown away at the simplicity and freshness of this salad. I scarfed it down! They make different pickles everyday – how awesome, right? That day they happened to be carrot and string bean. So delicious! I can’t wait to go back for more! 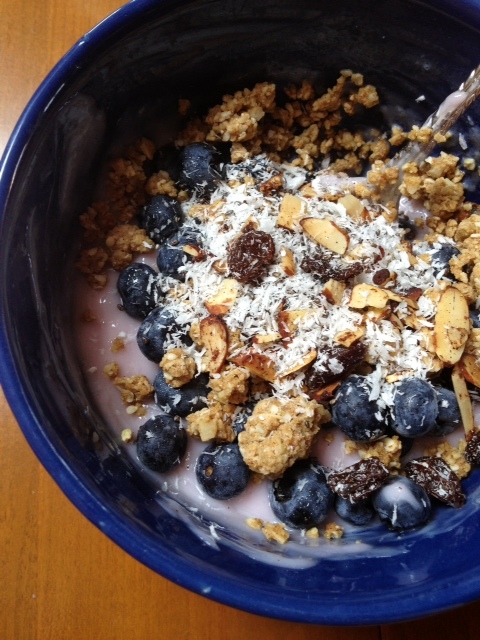 Speaking of Cape Cod, when I was away I ate yogurt bowls each morning. I topped them with fresh blueberries and a muesli I made myself (coconut shreds, raisins, cinnamon almonds, chia seeds and vanilla powder) These were the yogurts I used. Neither have Carageenan in them! 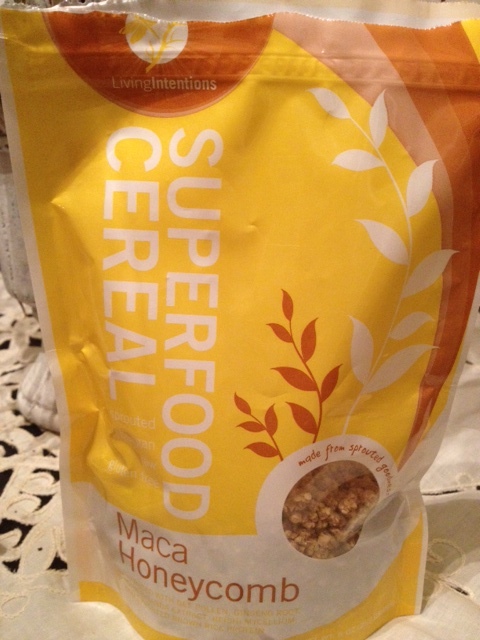 I sprinkled these on my yogurt bowls too and lately I’ve been sprinkling on my morning smoothies. YUM!!! I bought them HERE. They are loaded with superfoods and are delicious! 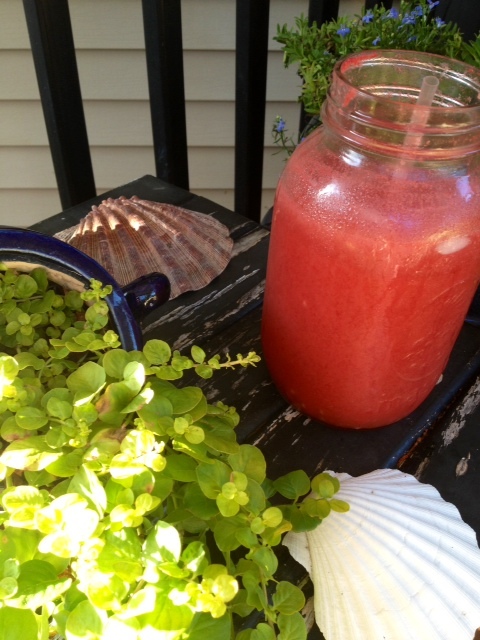 I am loving topping my smoothies off with extra goodies!!! I can’t get enough chips and salsa lately! These are my favorite non-GMO corn chips. Thin, airy, not too salty. 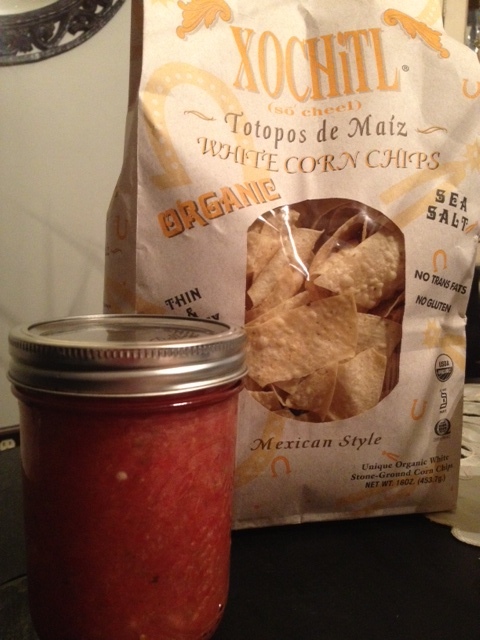 I made two big jars of homemade salsa using fresh tomatoes, jalepeno’s, onion, hot sauce and lime juice. Throw everything together in the food processor and viola! Check out my new snack! 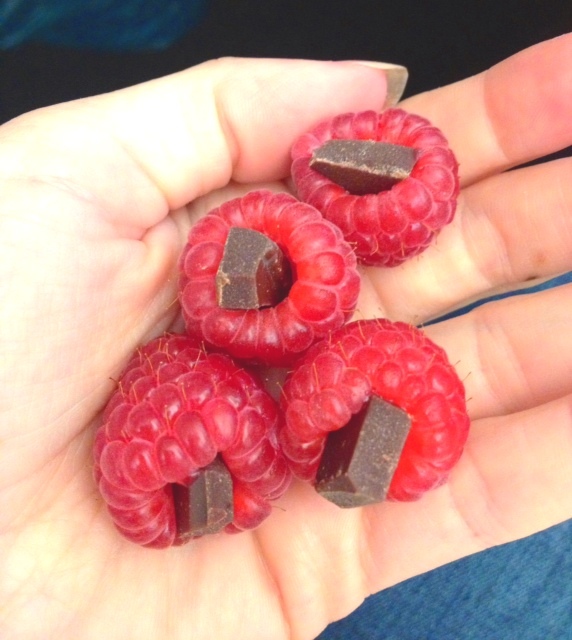 Raspberries filled with little chunks of raw chocolate I broke off from a chocolate bar. 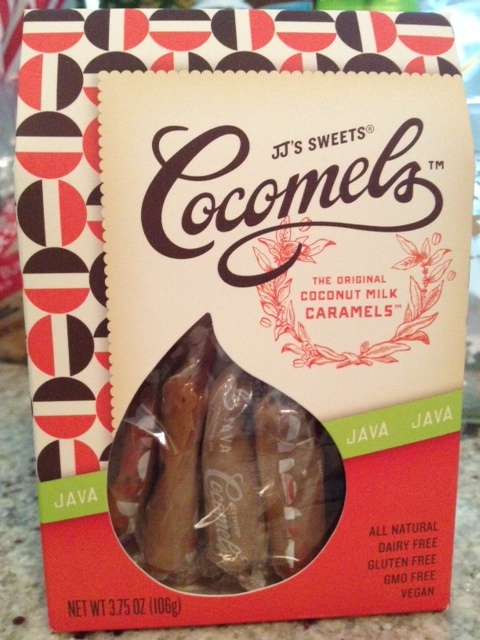 Great for when your craving a sweet treat and a great dessert or afternoon snack for your little ones! 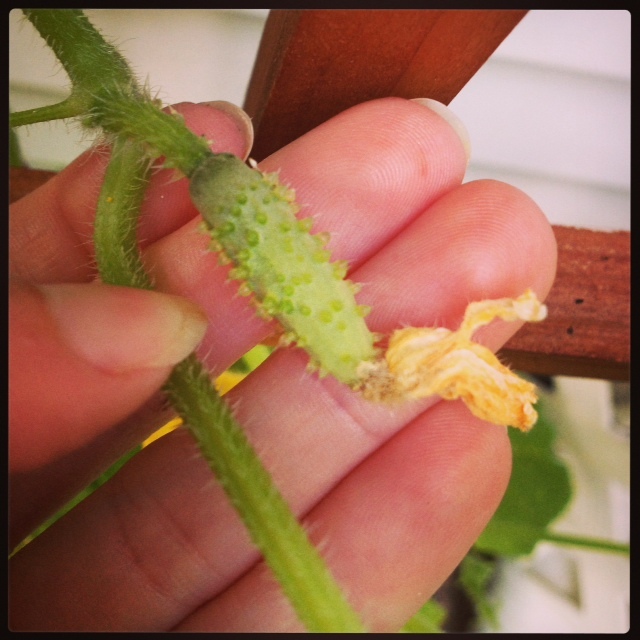 Lastly, I am loving watching my watermelons grow! They are growing up so fast! 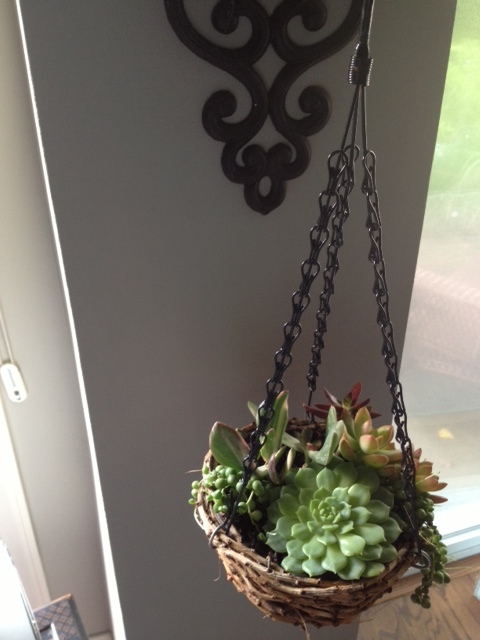 “What I’m Loving Wednesday” Coloring my World Green! I have lots of green things to share today! 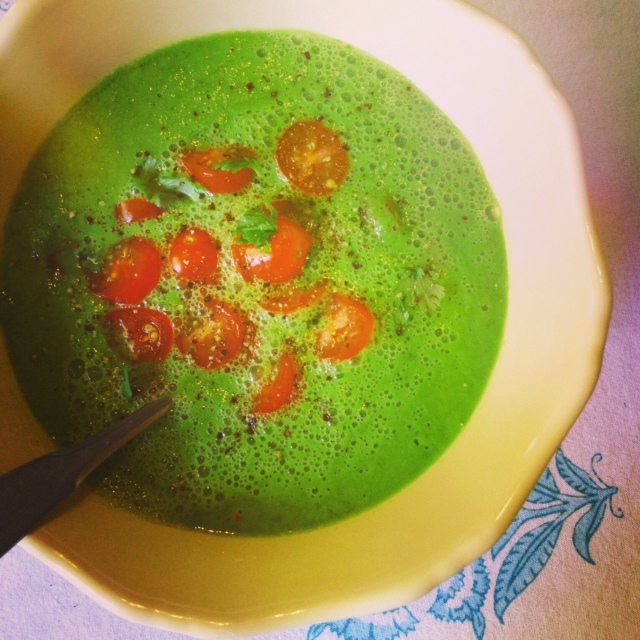 Green soup is definitely an acquired taste. If you like green’s as much as I do then give it a try. 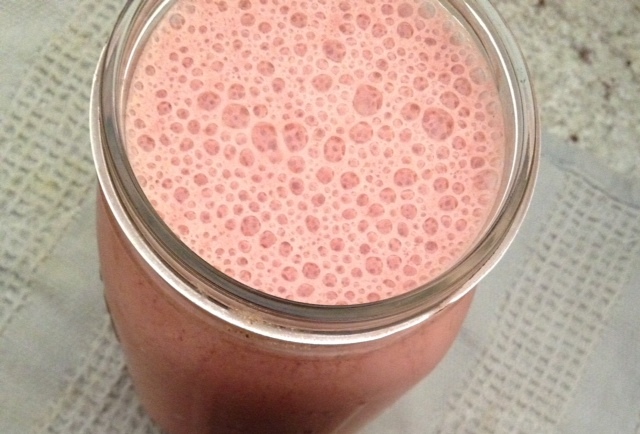 If you like green smoothies look at this as a savory style smoothie. 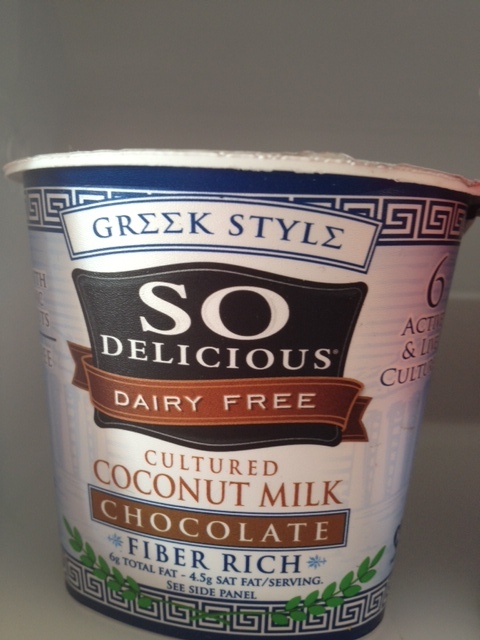 So easy to whip up and do I have to mention – NUTRITIOUS! 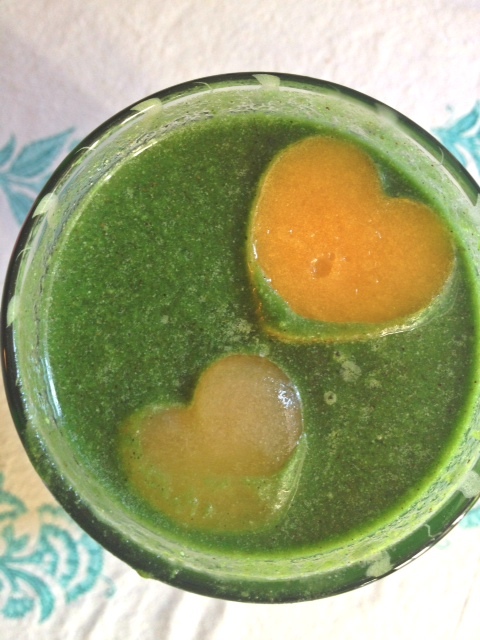 I blended spinach, watercress, onion, romaine, avocado, celery, lime, cilantro, cumin, s/p, turmeric. Add toppings for contrast and crunch. My favorite toppings are sprouts, raw squash noodles, or cherry tomatoes! I took a short vacation from green smoothies for a little bit but I’m back in action again. I have lots of fresh pineapple, which is the perfect smoothie sweetener and compliment to any greens. My darling heart orange juice cubes made me smile with every sip. If you don’t know who Markus Rothkranz is, check him out. I saw him on a Dara Dubinet video and am a bit intrigued by his health and success. His website is a bit over the top “New Age” spiritual-promotional style so don’t say I didn’t warn you. Set aside the image his website perceives, and you will see he has a good mission and beautiful intentions. 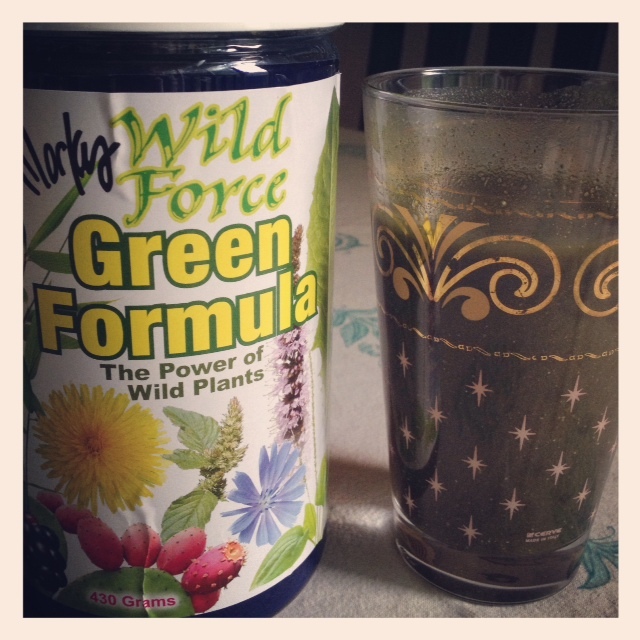 These Wild Greens taste great and contain amazing rare plants from around the world. 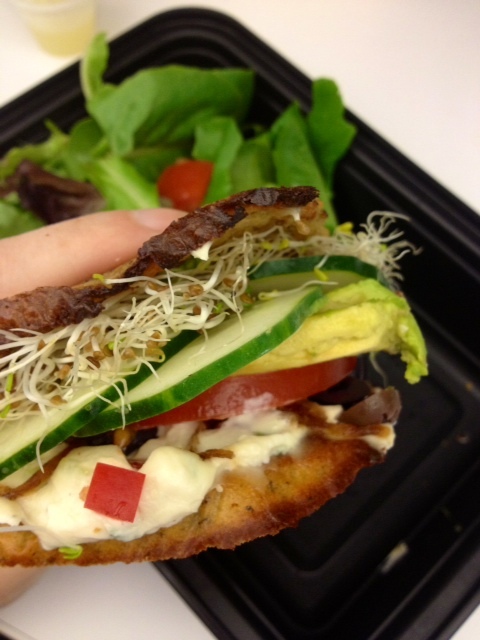 This is my all time favorite sandwich to get from my favorite Raw restaurant, Quintessence. I just discovered that I can get it on cooked Chickpea Socca bread….heaven! This sandwich has scallion cashew cream cheese, red peppers, cucumbers, olives, sprouts, “caramelized” onions, avocado, lettuce and tomato! 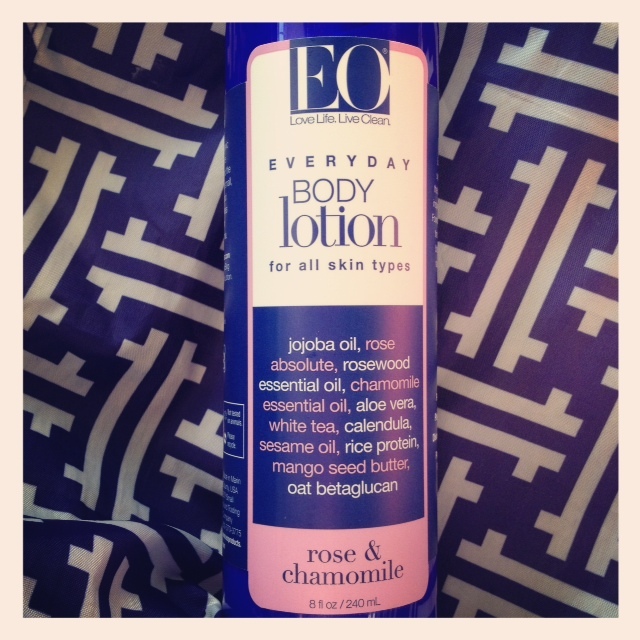 I love finding new beauty products that are all natural and smell beautiful! This lotion keeps my skin super soft and the smell reminds me of a spa. If you could bottle up the scent of a tranquil spa, this would be it. One other perk is that the scent lasts all day long! I am proudly announcing that I am off coffee! I used to have a cup every morning and if I skipped a day I would get withdrawal headaches. Dandy Blend has made it possible to stop this addiction! This is how I did it: I would fill my cup mostly with Dandy Blend and topped it off with coffee and gradually decreased through this method. Now I’m strictly on Dandy and can’t start my morning’s without it. 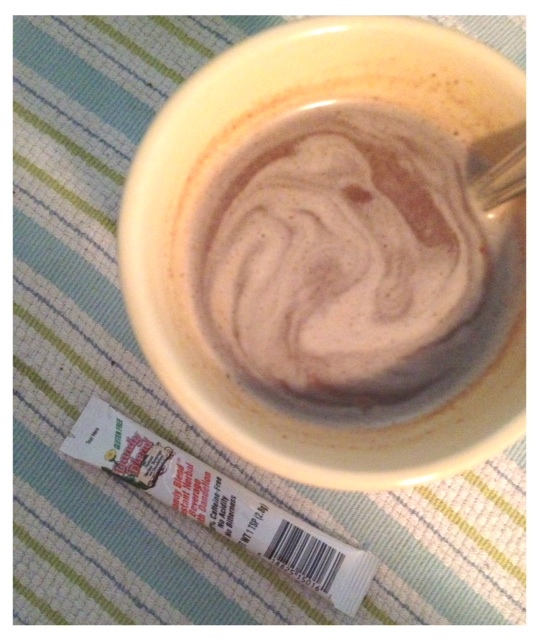 I mix it with almond milk and a few drops of Stevia. Every once in awhile I will treat myself to a cup of coffee but it makes my heart race now so I can’t drink too much. I think this is almost a good thing…it will help me avoid getting hooked again! 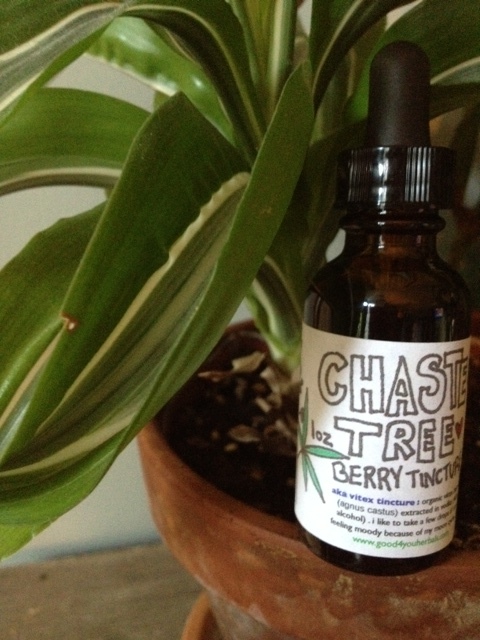 I started taking Chaste Tree Berry (AKA Vitex) tincture last week and plan on taking it for a 6 month period to help balance my hormones. Vitex can help the body establish a proper balance between estrogen and progesterone by encouraging the production of progesterone. If taken regularly for several months, it helps to restore hormonal balance and alleviate PMS symptoms and even menopause symptoms. 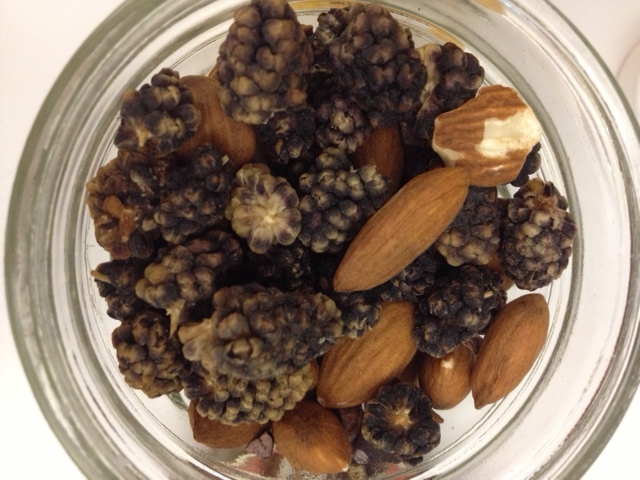 Purple Mulberries mixed with almonds and raw cacao nibs – my go-to snack this week! “What I am Loving Wednesday” Working my Chi. My Chi has been “sluggish” these days so I am trying to move it, shake it, get it going so I can achieve balance. Essentially I am trying to balance everything out within my body, including hormones, optimal organ function, and overall movement and flexibility of my joints. 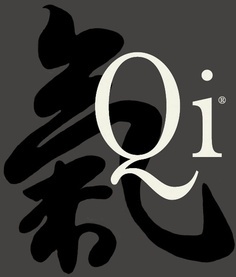 Qi or Chi(pronounced Chee) is a Chinese term that literally means breath, air, or gas. Qi is the fundamental life force or energy found in all living things. Qi is formed from the interaction of yin and yang energies. 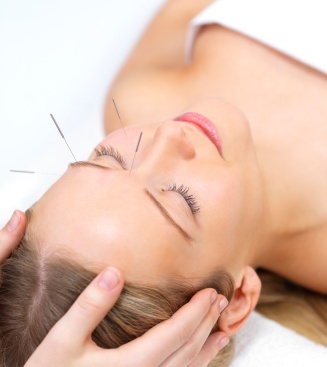 In Traditional Chinese Medicine theory, it is often referred to as the “energy” present in the Meridians and the organs of the body. I am loving my acupuncture appointments which help channel my Chi. 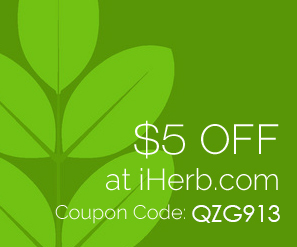 I watched an informative video on these herbs and how they can benefit me. I tend to hold a lot of chi-stagnation within my mid-center (abdominal area) in form of bloating, so this formula is said to help get things warm, moving and eliminate unwanted accumulation of edema dampness. 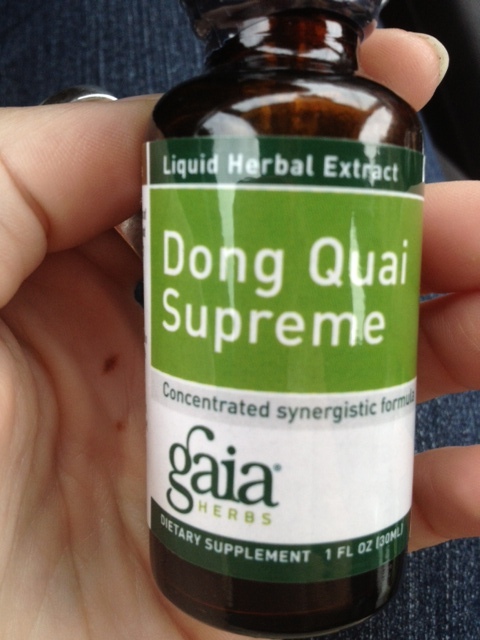 Another tool to help my blood flow is this tincture of Dong Quai. Noted as the “female ginseng” this herb has many benefits you may not know about. For one, it is an excellent blood tonic! 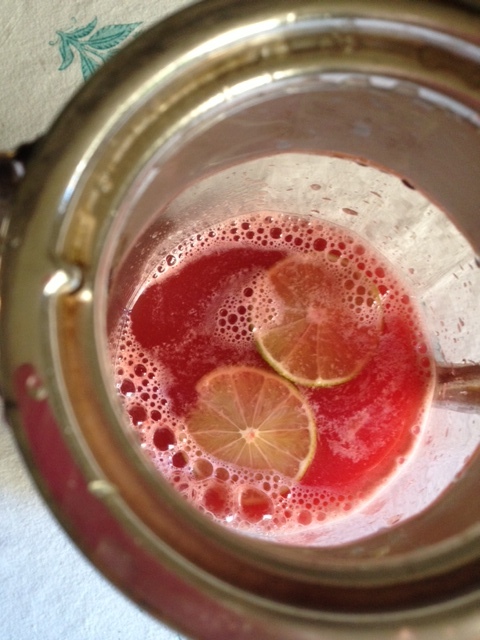 It helps replenish your red blood cells and increase blood volume. Read more about the amazing benefits here. Another great way to get the Chi flowing is by moving the body! I’m loving Yoga with Adriene lately. She is adorable, spunky and has a great energy to her. I have an Apple TV so I just project the YouTube videos onto my TV from my phone and do yoga in my living room when I wake up each morning. I’ve also been integrating a lot of deep breathing into my day and rebounding whenever I get the chance. Food is another tool to help balance things for me. 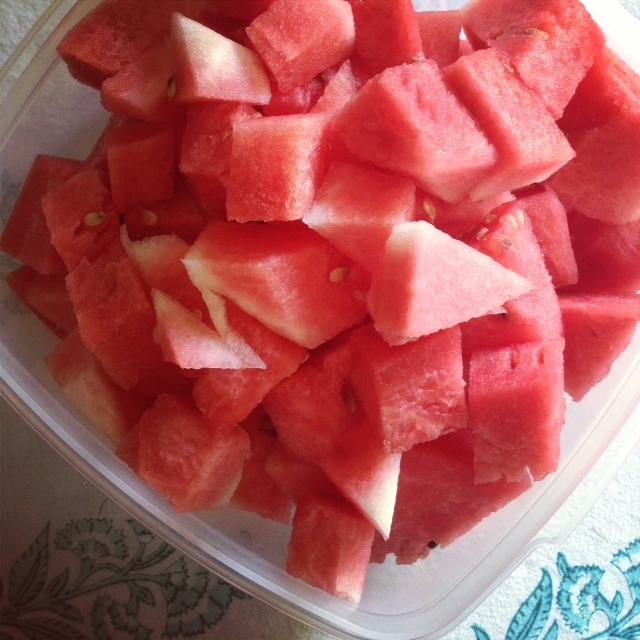 I’ve been trying to maintain a water filled diet by eating things like watermelon and cucumbers. 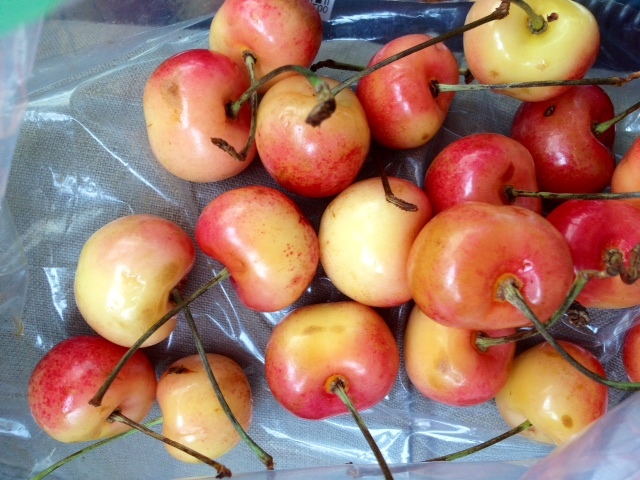 Cherries are my favorite summer fruit. They also have a high water content and are great for inflammation and protection against cell damage from free radicals. Donut peaches are amazing!! 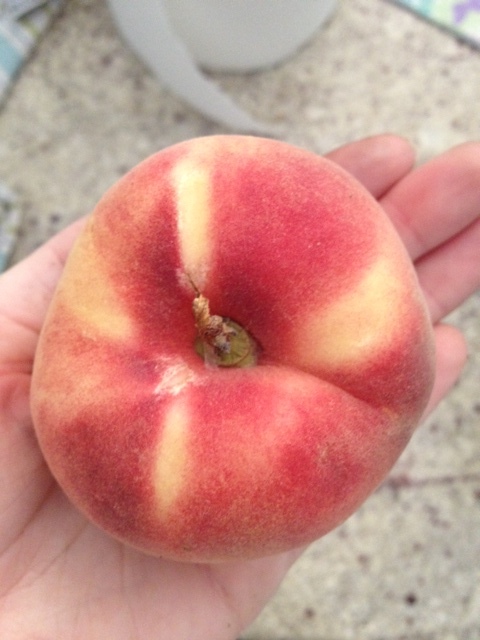 They are also known as Saturn peaches due to their shape…they are sweeter and have a white flesh and are less acidic then the traditional peaches. Pick some up next time you see them…you won’t be disappointed! 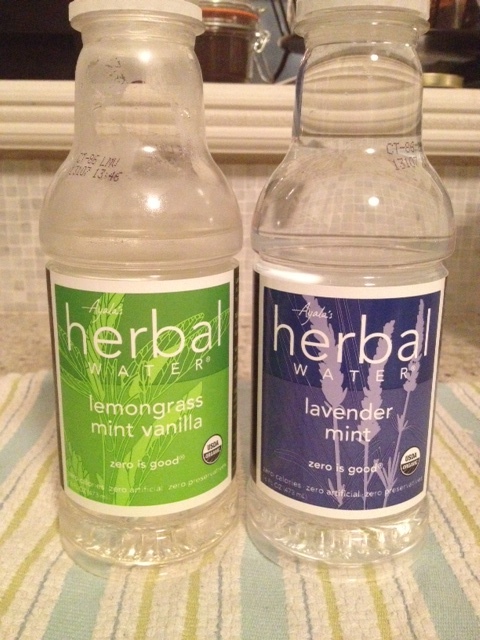 These herbal infused waters I found at Wegman’s. Sometimes plain water is just boring. 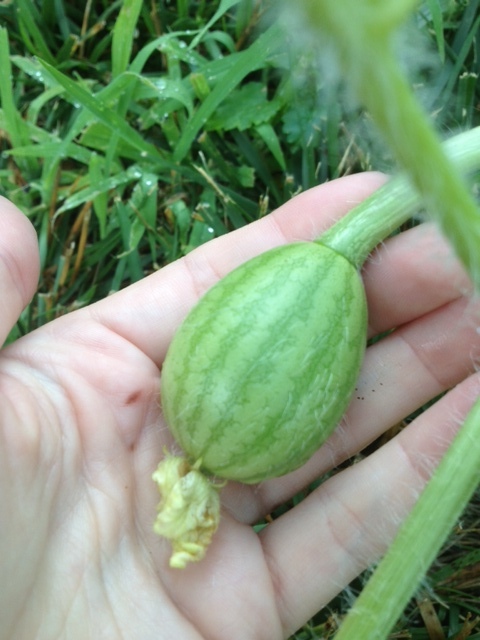 These have a pleasant faint flavor to them that are perfect for hot summer days!